GROUP OF SIX: Albert Medal for Saving Life at Sea, Second Class; 1914-15 Star; British War Medal 1914-18; Victory Medal; Colonial Auxiliary Forces Long Service Medal (EVIIR); Royal Humane Society of Australasia Bronze Medal. Albert Medal inscribed on reverse 'Presented/in the name/of Her Majesty/to/William Borland/Sapper of the partially paid/Submarine Mining Corps/in recognition of his gallantry in/saving a comrade from drowning/at/Middle Head Sydney NSW/on the/3rd April 1891'; 2553 S/Sjt W.Borland 11/A.S.C. A.I.F. on Star, W.O.W.Borland 11/A.S.C. A.I.F. on third medal, 2553 W.O.1 W.Borland 11 A.S.C. A.I.F. on fourth medal, 544 Cpl W.Borland A.E. 9.6.06 on fifth medal, William Borland/3rd April/1891 on last medal. First, fifth and last medals engraved, second, third and fourth medals impressed. First and last awards in inscribed cases of issue. 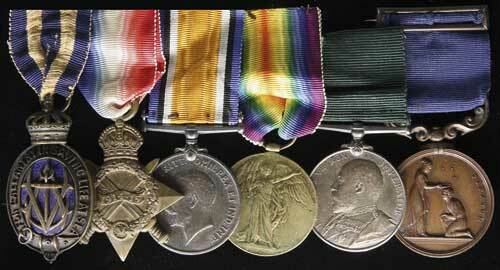 Good very fine and extremely rare, one of three Albert Medals issued before Federation. William Borland railway guard, aged 44 yrs, born Braidwood (NSW); Enl 23Sep1914 Marrickville NSW; Emb Sydney 19Dec1914; served with A.S.Corps; at Gallipoli; RTA 27Jul1917; Disch. 13Oct1917. AM: LG 18/11/1892. 'Her Majesty the Queen has been graciously pleased to confer the Decoration of the Albert Medal of the Second Class on - William Borland, Sapper of the Partially Paid Submarine Mining Corps, Sydney, N.S.W. On the 3rd April, 1891, a boat, containing twelve men and two officers, was engaged in submarine mining operations, about half a mile from the shore at Middle Head, Sydney, N.S.W. By the accidental explosion of a 100lb. gun-cotton mine, the after part of the boat was blown to pieces, and the two officers and two of the men were instantly killed, while the others were all more or less severely injured. Sapper William Borland, finding the boat sinking, jumped overboard in order to lighten her, and, whilst holding on to the gunwale, supported Sapper Brentnall, who was semi-conscious. Another of the crew, named Adams, in the excitement of the moment, jumped overboard, but when some yards away, called out for help, as he was unable to swim. Borland at once swam to his assistance, and supported him until a boat arrived from the shore some considerable time after. Borland was nearest to the explosion of any of the crew, and received severe wounds on the face, arms, abdomen, and legs, besides injuries to both ears. He was in hospital several weeks, and could not follow his ordinary work for some months." Together with original photograph of recipient in AIF uniform; copy of page from the London Gazette of November 1892; original and copies of newspaper clippings relating to the incident and the award of the Albert Medal (some with portraits and illustrations); his obituary from the Railway and Tramway Officers' Gazette and other related research. The partially paid Submarine Miners were originally part of the Torpedo and Signalling Corps which was raised in 1873 as a special company of the New South Wales Naval Brigade. They were transferred to the military branch in 1878. The permanent section of the Submarine Miners was established in 1888. In 1893 following reorganisation of the Corps of Engineers, both partially paid and permanent sections were incorporated into the Engineers, with the whole styled as the New South Wales Corps of Engineers. The Miners comprised No.4 Company based at Chowder Bay and George's Heights.